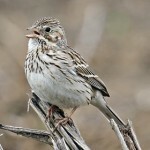 Song is rapid insect-like trill of dry “chip” notes, all on one pitch. Description: Sexes similar. 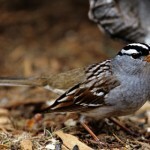 Bright chestnut crown; bold white eyebrow bordered by black below; unstreaked gray cheeks, collar, and underparts; back is brown with dark streaking; gray unstreaked rump; brown wings with two white wing bars; fairly long notched tail. Winter adults have duller chestnut cap and brownish eye stripe. Juveniles are brown overall with dark streaking. Behavior: Singing territorial males can be hard to find because they sit still among the branches. Habitat: Deciduous forest edges, parks, gardens, backyards, farmsteads, and other open areas with nearby or scattered trees and few or no shrubs. 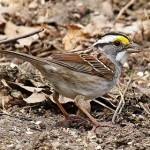 Common spring and fall migrant across the state. Where in Nebraska: Common summer resident statewide except for Republican River Valley. 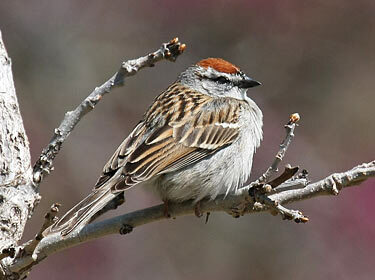 Fun Facts: The Chipping Sparrow’s nest is so flimsy that light can be seen through it.